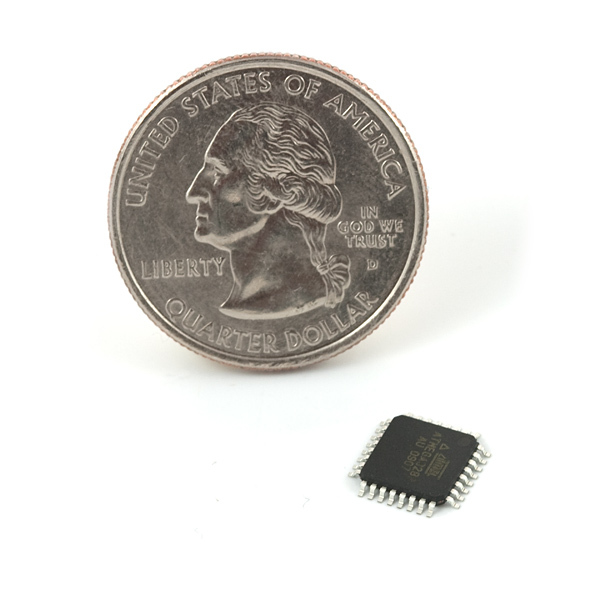 This is Atmel's high performance, low power 8-bit AVR ATMega328 microcontroller in a pint-sized TQFP package. Yes, you really can solder that. Note: There is no difference between this part and its previous version. This new copy was created to help make our in house assemblies easier to produce and manage. How is the best/easy way to burn Bootloader in this chip? The easiest way is to add a ICSP header to your project and then attach a programmer to that header after the IC has been soldered in place. 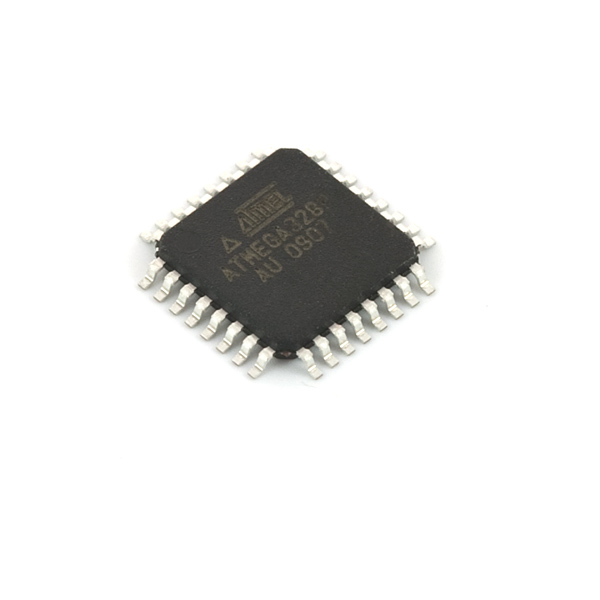 There are TQFP ZIF sockets you can get to program the chip before soldering, but they can be pretty expensive. If you add the header to your design you can add a bootloader plus make future firmware changes to the chip if needed. Is it possible to add the Aruino Optiboot to this with a 32 kHz (clock) oscillator on board? If not, what is the best way to program this (what IDE, what compiler toolchain, etc.)? Your favorite links or tutorials for programming this on a custom board would be extremely helpful. Thanks! 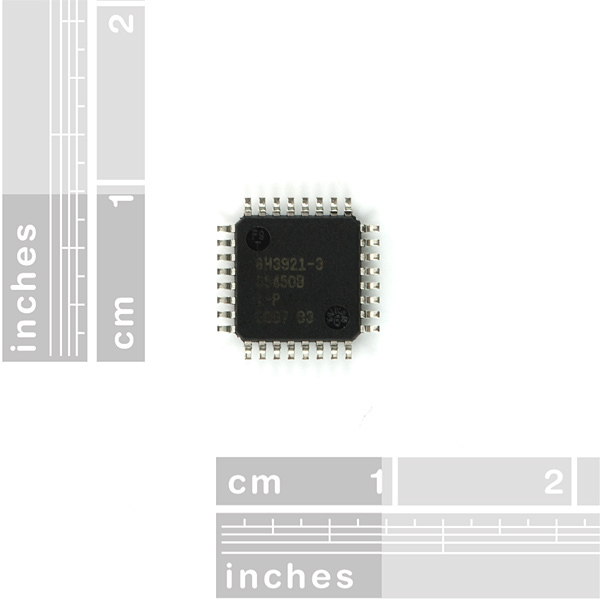 We usually run the chip at either 8MHz or 16MHz, which are the only officially supported speeds in the Arduino IDE. You can either use an external crystal or the internal 8MHz clock. While you can run it slower (4MHz, or 1MHz), I've not seen it run slower than that, so I'm not sure the 32kHz clock will be much help. You will need an AVR programmer of some kind to update the fusebits to switch between internal and external crystals (and use the internal clock divider if needed). After that you should be able to upload the Optiboot bootloader (make sure it is compiled for the correct speed). Also check out this tutorial on installing a bootloader. As for different programs, the Arduino IDE is pretty easy to use although does have its limitations. If you are using a non-standard configuration it is fairly easy to create a boards.txt file with the relevant information so the IDE can use it. AVRdude is also a pretty good program and is actually what the Arduino IDE is built on. Keep in mind it is command line so might be tricky. And don't forget the official ATMEL Studio. I believe the intent of the statement is that a new SparkFun web store item page has been created, which represents the same product as previously sold - an authentic ATMega328p as sourced from different vendors. Either the original web code was literally copied to generate this store page, or 'copy' as in - "text, especially of an advertisement". In other words, they are selling enough of these now that they need to track them more closely. Otherwise when they go to produce a run of some board, they may not have what they need on hand because so many have been sold through the store. We actually buy these and use them on quite a few boards (about 10k per month), but had enough requests that we sell the individual ICs as well which is probably why we are not an official distributor. Our primary supplier is Future Electronics although we've also been known to buy them from Digikey, Mouser, Arrow, and directly from Atmel. If you have any other questions please feel free to email techsupport@sparkfun.com and they help you out. Note: There is no difference between this part and its previous version. This new "COPY" was created to help make our in house assemblies easier to produce and manage. These are actual Atmel ICs and are fully functional according to the Atmel datasheets. They are manufactured by Atmel, yes.